HCV ELISA kit - HCV IgM ELISA kit | GMP | 818-591 3030-USA. The purpose of the HCV IgM ELISA Test is for clinical lab diagnosis and treatment of patients who are suspected of having a hepatitis C virus infection. This HCV IgM ELISA test is an enzyme-linked immunosorbent assay for qualitative identification of IgM antibodies to hepatitis C virus in human serum/plasma. For more than 50% of patients, HCV develops into chronic hepatitis and has become the principal cause of cirrhosis of the liver and hepatocellular carcinomas. HCV is now accepted as the major agent for non-A and non-B hepatitis transfusion infection. HCV is defined as an envelope, single stranded positive sense RNA (9.5kb) affiliated with the Flaviviridae family. Classification of hepatitis C virus is established through six major genotypes and series of subtypes of HCV. Blood donor transmissions of hepatitis C virus have notably decreased since screening started in 1990. Three generations of HCV ELISA tests have been established and each generation has resulted in improvement in sensitivity of detecting anti-HCV. Studies have shown that in a majority of cases, when detectable IgM response to both structural and non-structural HCV antigens occurs, the IgM response happens more frequently to the structural (core) antigen. The manifestation of HCV IgM can be classified into four types: (1) persistent positive; (2) intermittent positive; (3) transient positive; (4) persistent negative. Progressive liver damage is normally indicated by IgM responses types 1 and 2. In order to gauge the extent of progressive liver impairment and in aiding antiviral treatment, it is vitally important and useful for the chronic hepatitis C patients to know the detectable amounts of HCV IgM that are present. The principle of the HCV ELISA test involves a two-step incubation procedure in which an indirect ELISA assay for IgM antibodies to HCV is established. Before incubation, recombinant, highly immunoreactive antigens corresponding to the core and non-structural regions of HCV, are pre-coated to the polystyrene microwell strips. Blood donor transmissions of hepatitis C virus have notably decreased since screening started in 1990. Three generations of HCV ELISA tests have been established and each generation has resulted in improvement in sensitivity of detecting anti-HCV. This 3rd generation of tests has improved sensitivity. 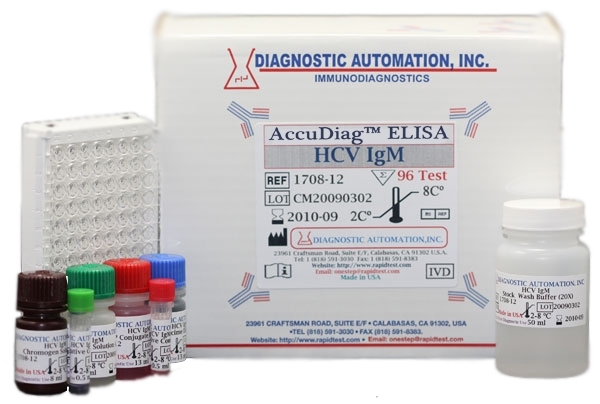 Diagnostic Automation Inc. HCV IgM ELISA Test Kit is a time and temperature sensitive method. To avoid incorrect result, strictly follow the test procedure steps and do not modify them.